SET Exam 2018. Candidates have to apply for the same subject which they have studied in PG. This Maharashtra SET Exam qualified candidates are eligible to teach as a Assistant Professor in Government and Aided Colleges of Maharashtra As per UGC Norms. There is no age limit for this Maharashtra State Eligible Test 2018. Maha SET Exam will be conducted on 28-January-2018. 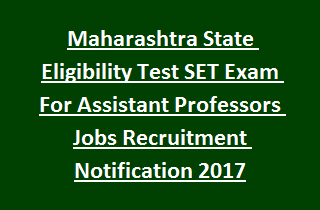 Candidates who want to make their profession in a respectable manner as a Assistant Professor they can apply online for this MAHA SET Exam on or before 26-October-2017 by 06:00 PM trough the official website of Http://setexam.unipune.ac.in. Admit Card available dates, eligibility criteria, examination pattern and other details are given below. Last date for applying online is 26-10-2017 by 06:00 PM. Candidates must have qualified Post Graduation or appeared for final sem exam and waiting for result they can apply for this State Eligibility Test Exam. Open category candidates must have at least 55% of marks in PG and for all others 50% of marks required. Candidates must have write the exam in their respective PG Subject only. Written test consists of three different papers. All the three papers will be conducted in single day only. All the three papers are objective type only. Each paper having four sets of A, B, C, D.
First paper consists of 60 questions which candidates have to attend the 50 questions. Each question carries 2 marks. Exam time is 10:00 AM to 11:15 AM. Second paper consists of 50 questions. Candidates have to attend all the 50 questions. Each question carries 2 marks. Exam time is 11:45 AM to 01:00 PM. Second paper consists of 75 questions. All questions are mandatory and each question carries 2 marks. Exam time is 02:30 PM to 05:00 PM.